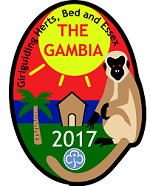 In April 2017, a group of 9 Guides from Girlguiding Anglia are going on an international service project to The Gambia. It will be an eye opening experience for everyone participating! As a means of fundraising we have made this challenge to go along with our trip badge. Thank you for taking part in this challenge and we hope you can feel more part of our adventure by participating!